The new mounting flange can be used on any Dwyer Instruments, Inc. gage that possesses a 4-1/2" (115 mm) diameter housing. The flange is secured to the gage behind its bezel with three set screws. The set screws hold the gage tight in place. The gage/flange can then be quickly attached to a surface or panel with a drill and the supplied mounting screws. The flange's three mounting holes follow the industry standard mounting pattern. The flange is made of a robust plastic composite and comes with three pre-installed set screws, an Allen wrench for tightening and three flange mounting screws. 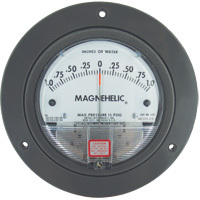 Model A-286 Front flange for panel mounting Magnehelic® gage.